Want to check that you’re the right weight for your height? Use the weight for height chart to see if you’re overweight for your height. Find your height in the left-hand column and move across the row to find your weight. If your weight falls within the moderate to severe overweight range on the chart, you are more likely to have health problems. Weights above the healthy weight range are less healthy for most people. We all know people who weigh less than we do, but that doesn’t mean a thing if they’re 4″ shorter. Check your weight loss goal is realistic for your height to make sure you haven’t set yourself an impossible target. Even a small weight loss of 9 to 19 pounds can help your health, as it could lower your blood pressure and cholesterol levels. 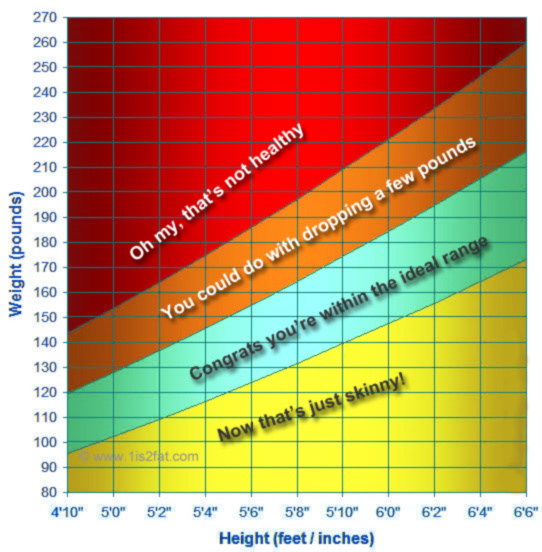 Generally, you don’t need to lose weight if your weight is in the healthy range on the weight-for-height chart. Or if you have gained no more than 9lbs since you reaching your adult height, and are otherwise healthy. Health experts tend to agree that adults can gain from weight loss if they are moderately to severely overweight (see the weight-for-height chart above). Health experts also concur that adults who’re overweight and have weight-related medical problems or a family history of weight-related medical issues such as diabetes, heart disease, high blood pressure, high cholesterol levels, or high blood sugar levels can be helped by weight loss. Remember to use our free calculators and tools to better understand the factors that affect your personal weight ideals. Help Keep us FREE, share with your friends!